W alking into Bar One Fourteen feels like crashing an extremely chill dinner party in the world’s coolest one-room apartment. 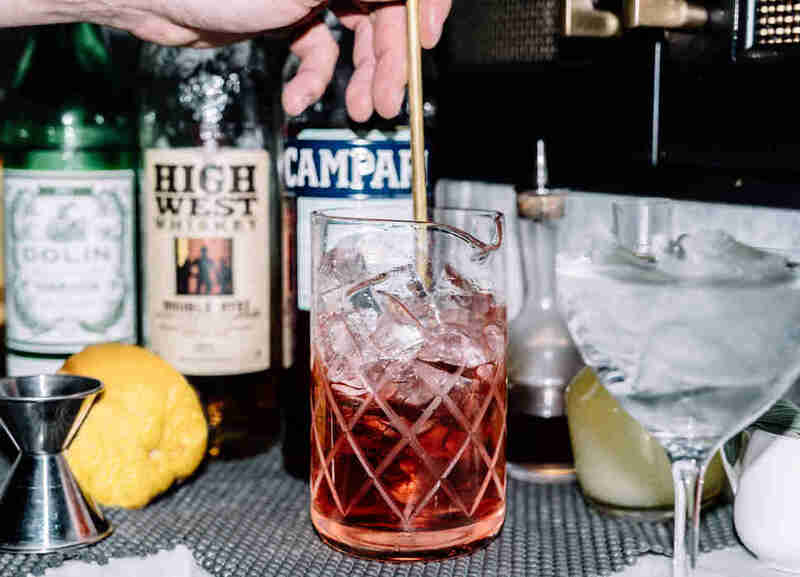 The food is prepared and presented with an obsessive attention to detail, and the drinks are mixed with a precision seldom seen outside of a chemistry lab. Even the tunes are tailored to enhance the ambience of this dark, intimate, downright tiny space. But don’t bring too many friends. Bar One Fourteen seats just 16 and is only open on Thursday, Friday, and Saturday evenings. It’s the brainchild of serial restaurateur Martha Hoover (Hoover’s mother) and sits cheek-to-jowl with two other Hoover establishments, Café Patachou and Napolese Pizzeria, in a tiny cluster of storefronts in the Meridian-Kessler neighborhood. It gets its name from its 114th East 49th Street address. If you manage to land a seat in this notoriously hard-to-get-into spot, expect a tour de force of thoughtful, elegant minimalism. 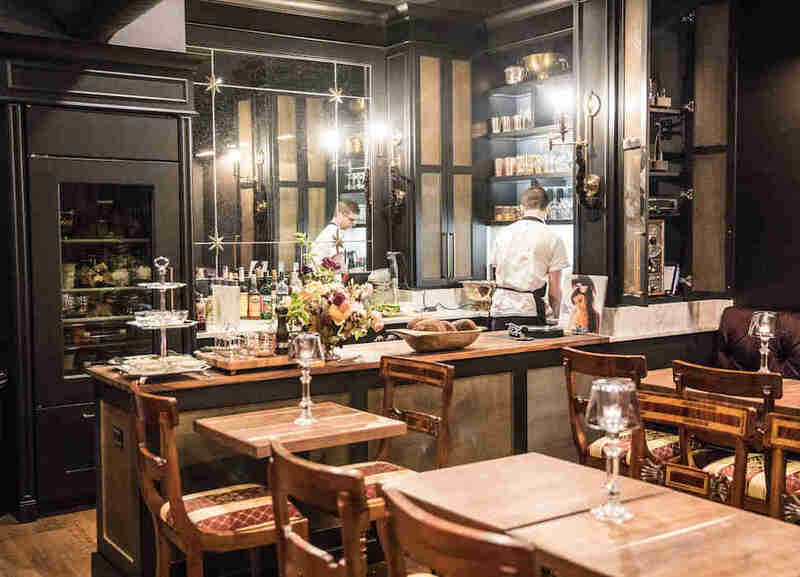 Decked with black walls, wood floors, and heavy velvet curtains, its cluster of tables and booths all sit within speaking distance of the tiny, modestly-equipped kitchen and bar where Hoover (a classically trained chef) prepares his dishes in full sight of diners. Go ahead and ask him, say, where he sources the cultured butter served with the house sourdough bread. He won’t mind. His lack of gear -- there isn’t even an oven -- doesn’t compromise the finished product. Indeed, Hoover says the spartan setup forces him to make sure each dish is well-thought-out and perfectly executed. And they don’t come any more perfect than the beautiful-enough-to-frame crudité plate, a colorful melange of colors, textures, and flavors arrayed on a bed of crushed ice. On the other end of the flavor spectrum, few hamburgers are as lovingly prepared, and offer as much toothsome allure, as the black truffle-topped Fancy AF Burger. The menu changes seasonally, but also receives regular tweaks to keep up with the market. 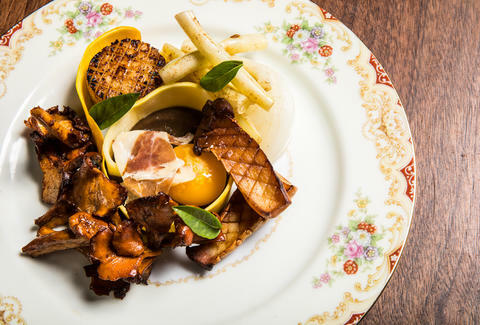 The crudité combo shifts constantly, and mushroom-intensive dishes may switch between chicken of the woods and wild shiitakes, depending on what looks best on that particular day. This mania for micromanagement extends to the drinks and music as well. Head bartender James Lantgen offers a short but potent lineup of his own cocktail creations. Try the Blood Orange Paloma, or A Proper Mai Tai, served in a brass, pineapple-shaped chalice, complete with brass straw. And if you insist, he’ll also make you a dirty martini, or any other traditional favorite you ask him for. Bar One Fourteen is also equipped with a primo sound system, including custom Klipsch Forte speakers, a vintage reel-to-reel tape player, and a vinyl turntable. Hoover and the staff pick which toons to play on the all-analog system each night, making sure the sonic energy coordinates perfectly with the food and drinks. Though you might want to get a reservation -- or at least arrive early. Even though Bar One Fourteen leaves tables open every night for walk-ins, it doesn’t take much of a dinner rush to fill the place.